← LOVE POE’S “A DESCENT INTO THE MAELSTROM?”…DON’T MISS MARK SUTZ’ “GIBRALTAR” ON READ SHORT FICTION! 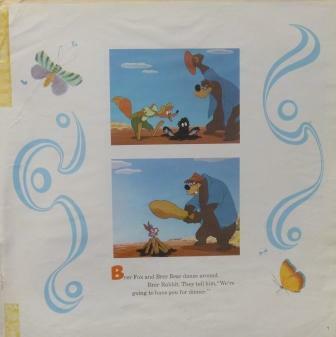 In the last episode, I said goodbye to whatever Disney albums I had left, most of which were in absolutely deplorable condition—yet despite that, they were still the most difficult things to let go of so far. I couldn’t imagine why it was so hard—after all, they were ruined. Damaged. No point in keeping broken junk; when I went through them one page at a time, however, I realized why they were harder than anything else. 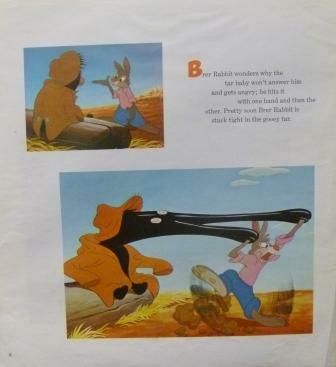 The artwork in the Disney booklets had, when I was a child, hypnotized me. I was surprised to discover that the images that had deeply affected me back then still affected me the same way now. 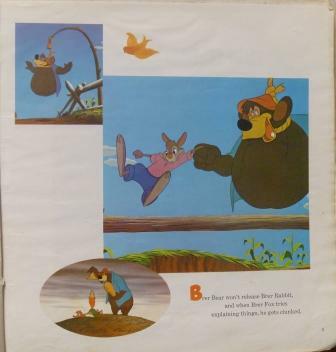 And not only did I fully recall those strong emotional responses, I came to understand that these images shaped my early opinions of certain things. 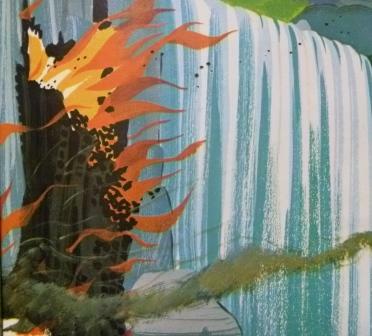 In short, the art in many of those beloved Disney album booklets affected how I see the world. Here is a brief tour through each of my favorite images and how they affected me. This scene, from the booklet accompanying 3909—Alice in Wonderland, was one of many my mother used as reference to make our Halloween costumes in 1974, below. I am certainly thrilled to be Alice in Wonderland! 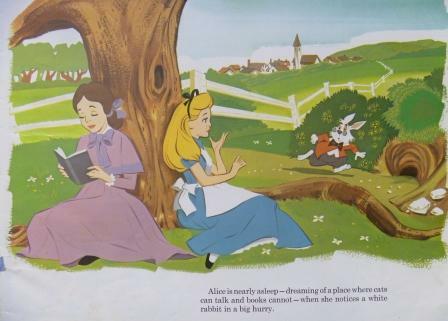 My brother Chuck, on the other hand, looks a little too grumpy to be the White Rabbit. Halloween, 1974. 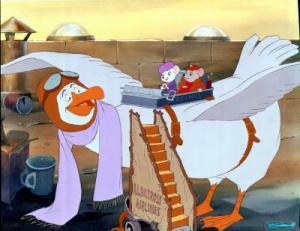 This shot of one of the cels that illustrates The Rescuers record album (the one that I kept) was used by my mother as a reference for our Halloween costumes in 1977. 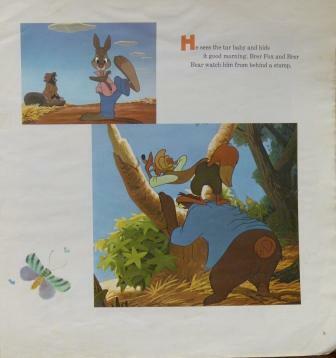 One of the things I remember about this scene (in the film and in the album, which I played to death) was Bianca’s comment, “I can’t, it’ll wrinkle my dress.”How did Disney’s The Rescuers affect me? Well, I still believe that there’s someone out there waiting or looking for everyone, and that when you’re in trouble, there’s always someone who will help you out. 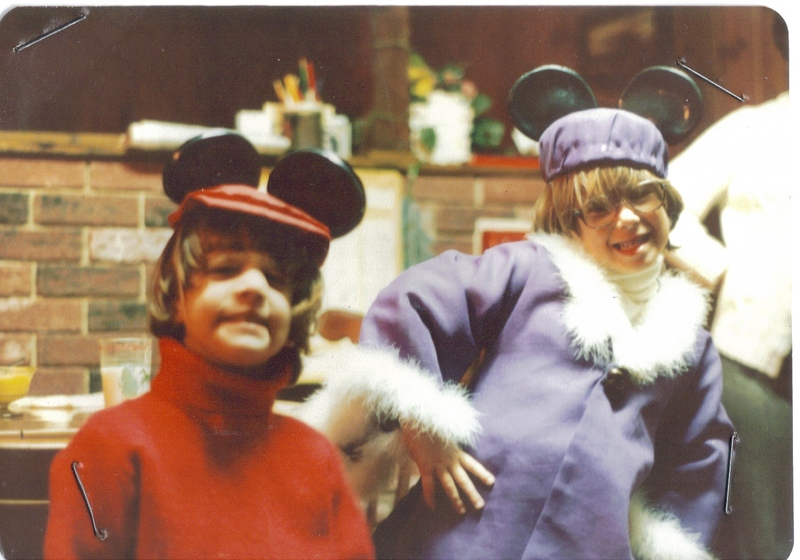 Chuck as Bernard and me as Bianca from Disney’s The Rescuers, Halloween, 1977. Anyone who knows me knows I have a fear of and fascination with fire. 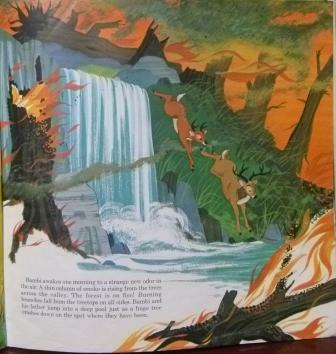 My earliest memories of fire, and the terror I developed of it, came from the following images and text. What amazed me about this picture was the dark, orange sky. I was fascinated by the fact that in the earlier pictures in the booklet, the sky was beautiful and blue; here, it was dark and threatening—and it had seemed to occur in practically no time at all. This was my first exposure to the concept of destruction: before and after. My love of films like The Towering Inferno, The Devil at Four O’Clock, Dante’s Peak and the like stems directly from this image; probably, also, does my love of abandoned buildings, because they, too, have a sense of lost beauty—granted, forlorn rather than violent, but still lost. I took a close-up of the fire coming out of this log, here, because this is the image that made me recognize that fire was pretty. I just couldn’t stop looking at these flames—the white part reminded me of marshmallows, and the cinders surrounding the flames looked like a breaking crust of chocolate, like I’d seen on the ’Smores we made when we went camping. Seriously. I remember wishing I could lick this picture and taste the flames, because I was certain they would taste like ’Smores. Even now I think this is a powerful paragraph. I had an image in my mind for each sentence, and the thing that disturbed me the most was the last one—a tree crashing right where they had been. 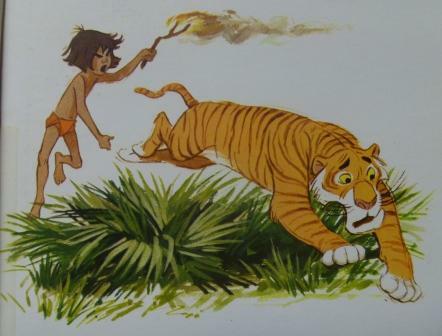 A fan of The Jungle Book but no fan of Sheer Kahn, certainly, this image of fire still scared me—I thought it was mean for Mowgli to tease the tiger. While I was attracted to the way the fire was drawn—it was like a smear—I think what bothered me more about this was the audio that went with it on the record. It was quite terrifying, as I recall. I remember being scared for all the people who were trapped in the castle who couldn’t get out, and I wondered how Robin could be so selfish as to leave them all in there even if they were his enemies. It also, for some reason, instilled in me that I had better be ready to jump out a window if there were ever a fire in my house. Every night before bed, I would climb up on a chair so I could reach the window and unlock it. I was too young to realize I should have pulled the screen up to make it easier to get out. I don’t do that anymore as an adult for security reasons—all my windows are locked—but at least one window in my bedroom, no matter where I have lived, has a screen removed to make it easier for me to escape. All of that came about because of this image. It’s the Siamese Cats from Lady and the Tramp! These cats, for some reason, were how I pictured demons from hell might look like. I don’t know why. This picture scared me—even though we did have a cat when I was little; his name was Cuddles. His name was a misnomer—he really wasn’t very cuddly at all, was an indoor-outdoor cat and so most of the time was bringing in things like dead birds and snakes as presents—but he didn’t scare me as much as these cats did. In short, why I was terrified of dogs for most of my young life. It’s true. 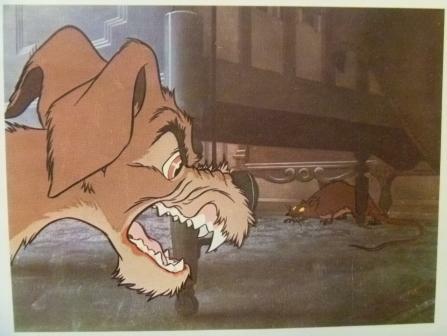 This movie cel image from 3917-Lady and the Tramp absolutely scared the daylights out of me, and yet I remember I couldn’t stop staring at it—probably due to the whole psychological well-known fact that things which frighten us also fascinate us. Whenever a dog would bark, or bound toward me, I’d run screaming—and it was all because of this picture. How do I do around dogs today? I’m alright. I can be skittish or nervous at times depending on the dog, but mostly I’ve learned how to force myself to just deal with it. 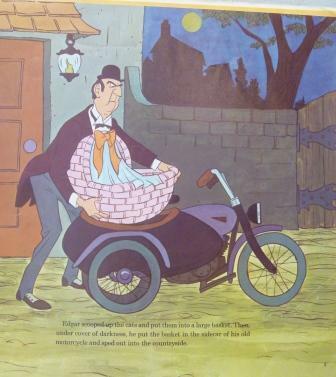 From the booklet for STER-3995, The Aristocats. 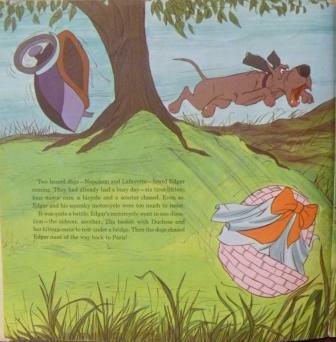 I was very attracted to the basket (I didn’t know it was called a bassinette back then); it was just so neat-looking and looked like it could contain something edible, like bread or cookies (not the kittens, like in the story). To this day, I’m certain it’s the reason why I have a fascination with baskets, picnic baskets, when they are full, in particular. I like to, if I’m taking them out someplace, make sure they’re packed picture-perfect. Again, it was all about the basket. I was fascinated by the fact it was tumbling down the hill, but nothing was spilling out of it. 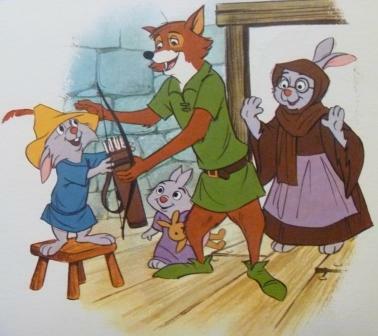 In this scene from Robin Hood, the birthday bunny is being treated to a quiver and arrows. 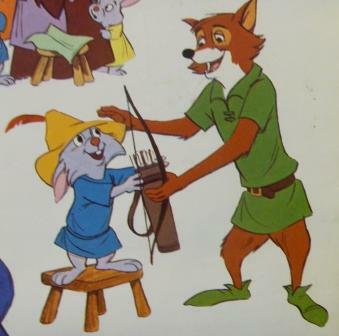 I liked this because Dad had given me a quiver and arrows and this one looked just like mine. 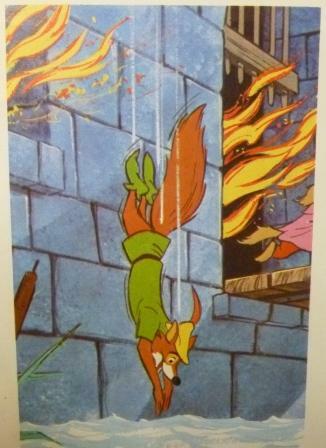 Also from Robin Hood. 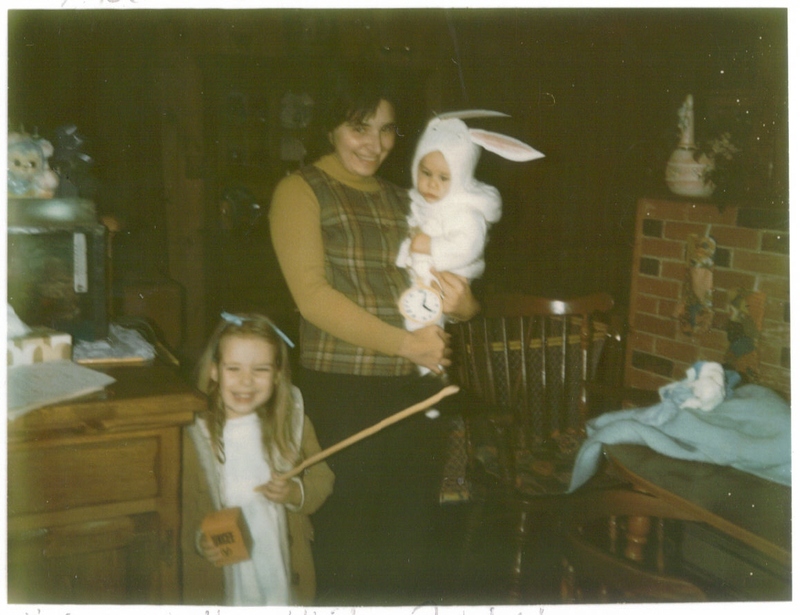 I liked this image because of the gleeful expressions on the birthday bunny’s sibling and Mom. It taught me that watching someone else be happy is sometimes a greater gift than being happy just for you. Seriously, that’s why I was obsessed with this picture. I wanted to grow up and learn to be happy like that. 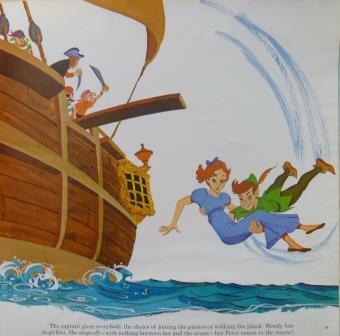 This image, from Peter Pan, is directly responsible for my whole love the “damsel in the distress” scenario. I loved the idea of being rescued…and still do, and the theme of rescue, physical, emotional, or otherwise, shows up in many of my stories, although it was much more prevalent in the stuff I was writing when I was a pre-teen and teen than it is now. My short story “Doors” is the most recent thing I’ve written in which this theme exists. 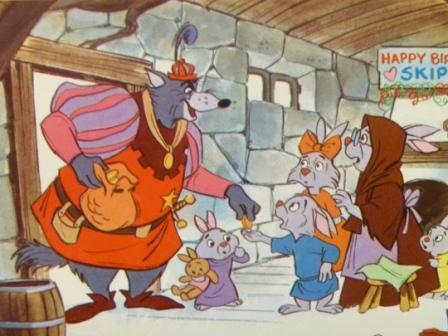 I could call the effect this image, from Robin Hood, had on me as good OR bad. It wasn’t so much the rescue—I loved the way his arm fit around her waist. Like she was tiny and weighed nothing. I half suspect this is part of the reason why I’m really weight-conscious. Seriously, I do. 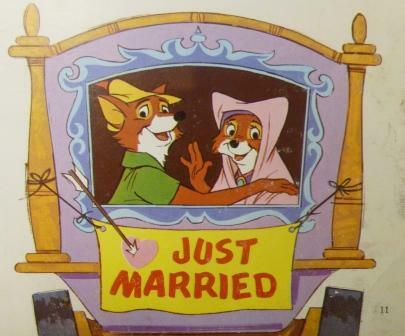 This image appealed to me for two reasons: 1, I couldn’t wait to grow up and have my own home; 2, this truly was my very first introduction to the idea of “love at first sight.” This image made me believe that this was the way true love worked—you met, and that was it. Who doesn’t love a happily ever after—although of all the happy endings, this one was my favorite, because I felt like after everything they’d been through in the story they deserved a break. This part of Robin Hood was how I developed the concept that two people need to be complete, strong beings on their own before romantically coming together with another. 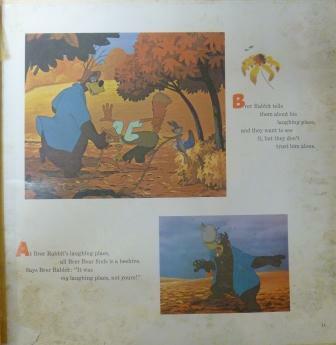 3907, Stories of Uncle Remus, was my favorite album of them all, and I know why: with this booklet, it wasn’t about the images as much as it was about the stories. 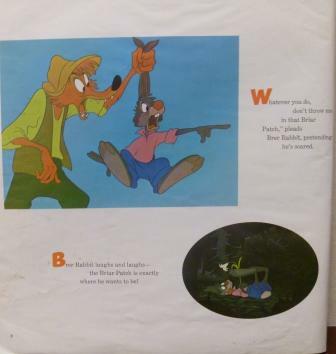 I liked the concept that Brer Rabbit could lock up his house in the Briar Patch and just…well, leave…and do whatever his heart desired. 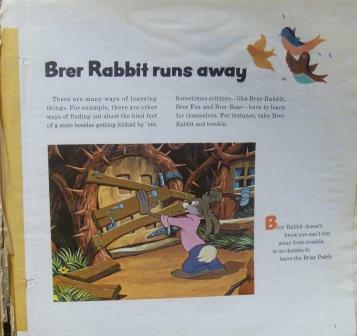 Since I really couldn’t stand the house I lived in and how dark it was, and I hated the idea that I couldn’t make my own decisions about what I wanted to do with my day on the weekends, that Brer Rabbit could do this really appealed to me—he was inspiring. I would sit around and fantasize about escape, about the day I could just walk out of the house and go live somewhere else on my own (I will reiterate here that I was three or four years old when I was having these thoughts), when it would happen, how it would happen. 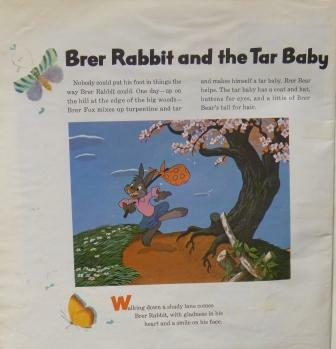 I never tried it, but I did build a secret hide-out at the back of my closet, put some raisins, books, water, and even a small lamp in there, and whenever I wished I could do just like Brer Rabbit had done, I would vanish into that closet and dream. This picture always made me wish I could hammer and nail things—that I could build something, like a really cool tree fort. I don’t know why, but it did. I remember thinking that every time I looked at this image. 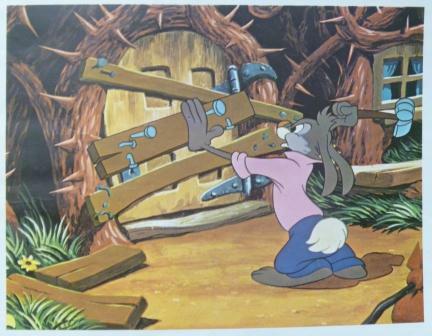 Here’s a close-up of him nailing his door. I was always worried, though, that he was going to hit his hand with the hammer—his finger is awfully close to that nail! Look at the left of the photo—you can see the tape Mom used to try to keep the pages in the book. It was, obviously, dried out and ineffective. 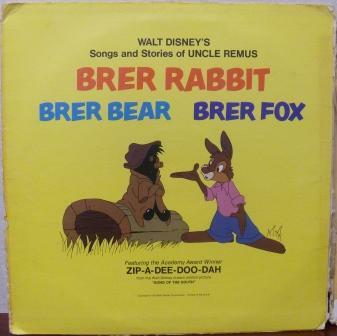 Another reason Brer Rabbit appealed to me was because he was clever and smart—it seemed he could always get out of any situation. What I learned from him was that it was always best to think before doing—and listen to your instincts. He also inspired me to believe that I could do anything I set my mind to, including getting out of a seemingly impossible situation. Look closely at this page—see all the mildew damage? Sad, just totally sad. 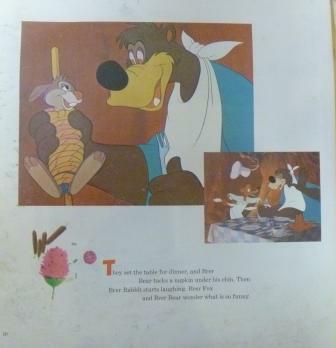 Posted on August 11, 2011, in Deep Thoughts & Fun Stuff, The Goodbye Project and tagged Disney Record Collecting, Disney Records, Feng Shui, Goodwill, Hoarders A&E, Hoarding, How to Get Rid of your Junk. Bookmark the permalink. 3 Comments. Hey, Monica! I’m so happy to hear from you! 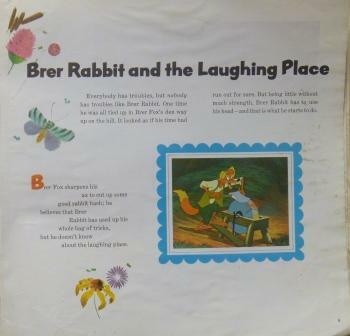 Oh, man…I think, now that you bring it up, I might have had the Sleeping Beauty album, only because I totally remember the pages of artwork with that terrifying dragon. I’d have nightmares because of it. 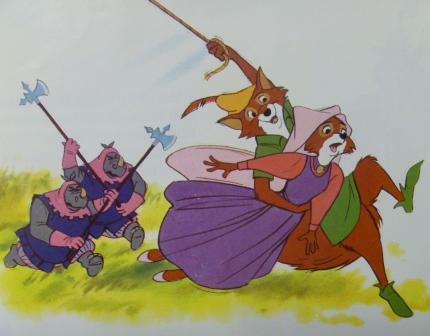 I just remembered, thinking about it, that I had the Disney’s Robin Hood sheets and curtains (I don’t know why your mentioning of Sleeping Beauty brought that up, but it did). I think, too, the albums did inspire my love of story and of acting, so I hear you there. I specifically remember mimicking lines. You probably did, too! If you still have the album, you can probably get a turntable at a tag sale so you could at least play it for her. It would be great to pass your love for it down to Morwenna. I can’t believe she’s FOUR already! Where does the time go? 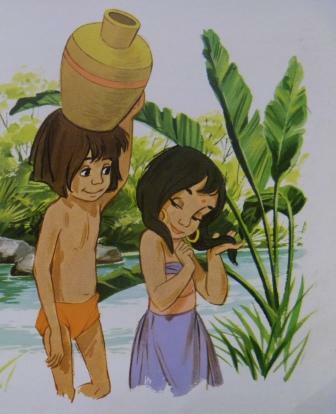 Oh, we used to think Mike was CUTE! (I watched that series recently on DVD and I was like, ‘wow, those jeans are TIGHT.’) I don’t know, maybe he was to a bunch of teenage girls in the 1980s! Reading much of this does remind me of those times when it was rather hard to know or have heard of any of these Disney movies unless they didn’t happen to be playing at your local theater or the time or a chance screening someplace (like the time I saw The Aristocats during school in the gym off a 16mm projector). 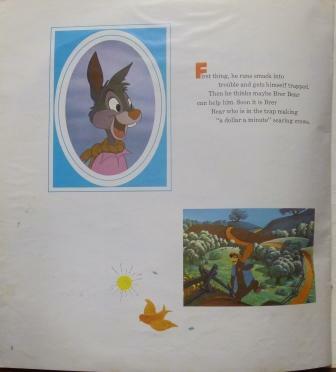 The only way we ever knew these movies at all was through the storybooks, record albums or scant clips that might show up on TV like on “The Wonderful World of Disney”. The pre-home video era was quite an interesting time when the studio didn’t want to spoil us with having these things out more than once every 7 years or so. The original thinking as Walt wanted it was for these films to be shown from generation to generation this way. Patience in the digital age certainly doesn’t cut it anymore. 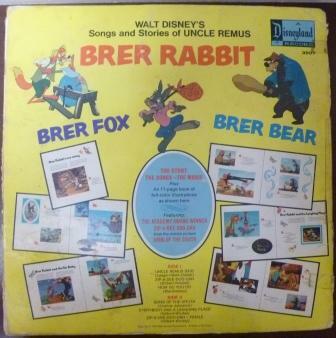 I do recall having that Uncle Remus LP you’ve posted pics of myself. 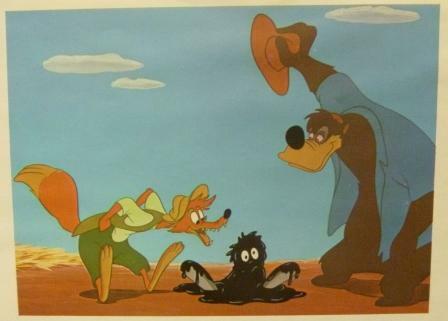 For years I wanted to see that movie it was based on, but never saw the 1986 release of Song of the South when it happened, and it wouldn’t be until sometime in the late 90’s when I paid some $30 or so for a nth-gen VHS copy of the UK release when I finally got to watch the film that the studio would rather we’d forget all about.